JONNY MAY: I hate heights and flying. Our flight to Edinburgh got cancelled this season so we went by coach – that ended up being a good trip with no stress. RW: Have you got any hidden talents? JM: I can play the drums. When I was younger I played a lot, but the neighbours weren’t too happy about me banging on the drums all the time. They are still back at my mum and dad’s house. 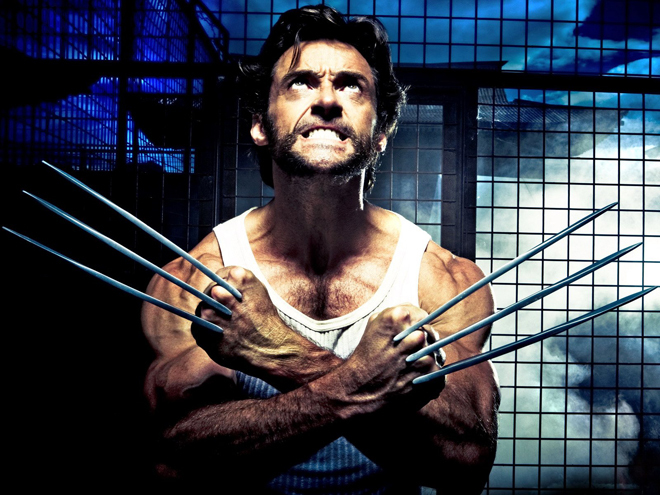 JM: Wolverine (right) – Hugh Jackman. He’s the man. JM: A pet lizard. It was good for 30 seconds but then I got bored. I had to feed it crickets and I worked out it was going to be expensive, plus it tried to bite my hand off. After a couple of months I gave it to a friend. JM: I wouldn’t walk under a ladder when I was younger, but not so much now. My girlfriend won’t walk over three drains in a row. JM: Just myself really. Anyone else in the lift would get on my nerves so I’d be happier in there on my own. JM: I’m doing a degree in sports business so I’d like to finish that. JM: Barack Obama. I just think he knows a lot of stuff we don’t know. Beyoncé – she could sing whilst we eat and is a really good performer. Lady Gaga would make a good mix. I don’t know why her – I was thinking of singers and she came to mind. RW: Which one of your team-mates would you like to be? JM: Shaun Knight – it would be interesting to walk around with that body weight for a day! JM: I just go about my business – if people find it funny… Andy Hazell is always joking about and Henry Trinder is a good laugh. JM: We were squirting hand sanitiser on Nick Wood’s bald head the other week – he’s got a big egg head! A few young guys like Henry and Shaun wanted to kill time between sessions. JM: Looking back, probably having my pants pulled down at the 2010 Junior World Cup against Australia. Someone did it on the 22 but I kept going for the try-line and scored. I wasn’t thinking about it on the pitch but I’ve since seen the video back. I can laugh at it now but not at the time! JM: I hate littering. When I see people dump fags or chewing gum I shout at them. RW: Why are you no longer on Twitter? JM: It’s all rubbish – I hate social media. It’s a waste of time in my opinion – a time killer. JM: Probably as a unique person. This was published in the March 2014 edition of Rugby World.